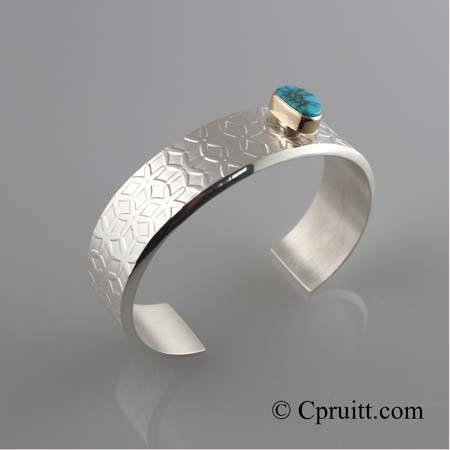 Collection of Diamond, turquoise cuffs. 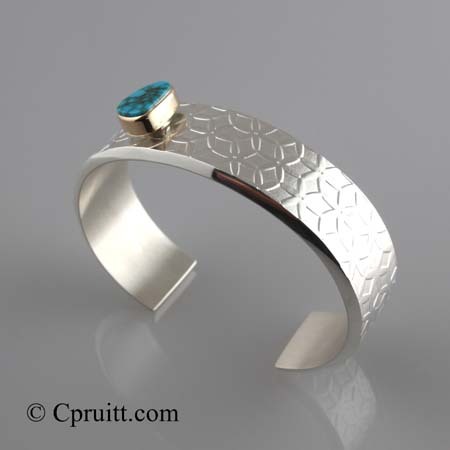 Textured, Sterling Silver, 18k, Bisbee Turquoise, VS/G Diamonds finished with a heavy patina. 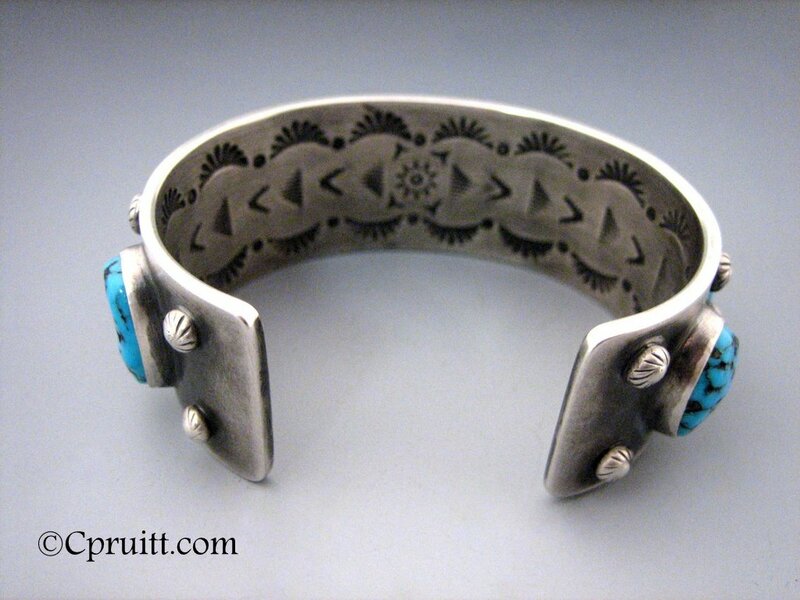 Sterling Bracelet with Coral, Lone Mtn turquoise and Diamonds. 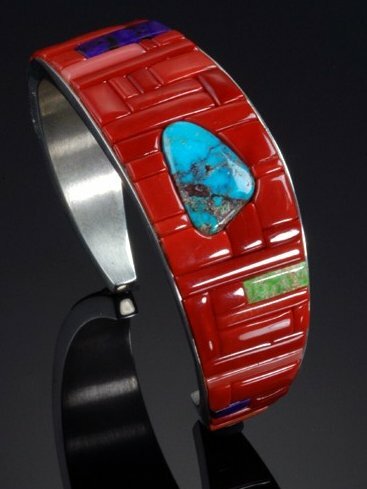 1st place Eiteljorg Museum Indian Market and Festival, 2012. 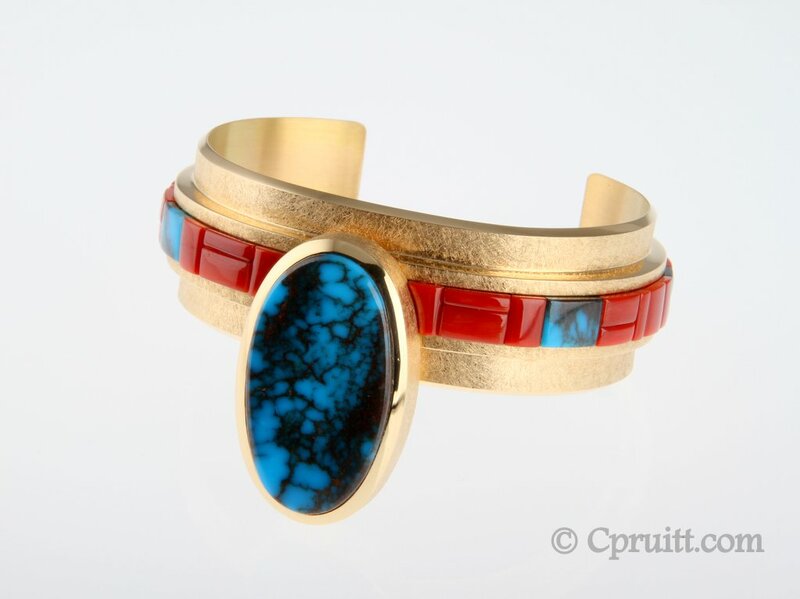 #8 Turquoise Bracelet with 18k Gold Bezel. 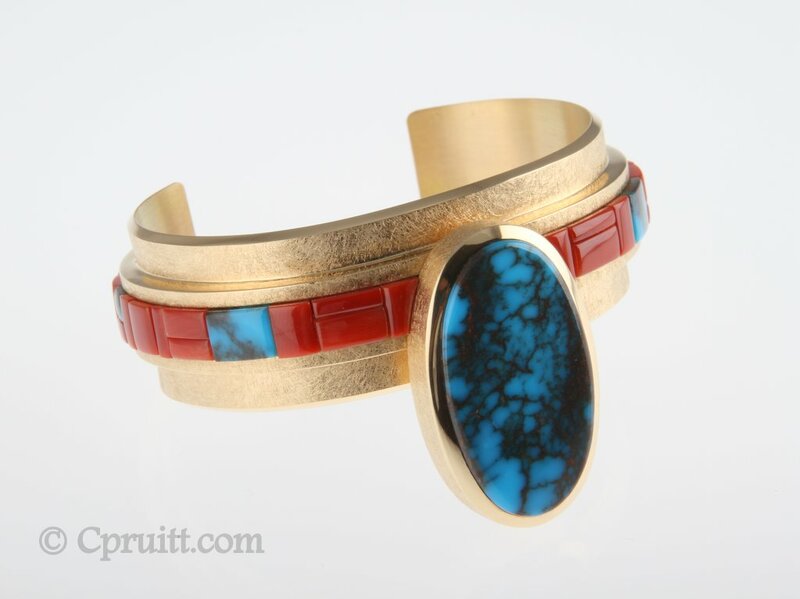 Lone Mountain Turquoise Bracelet with 18k Gold Bezel. 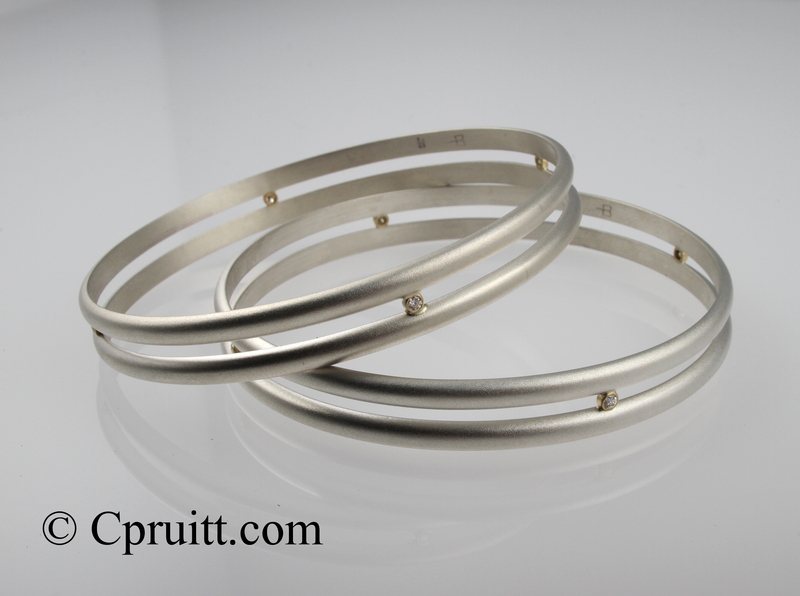 Day & Night sterling bracelets with gypsy set diamonds 3/4in wide. 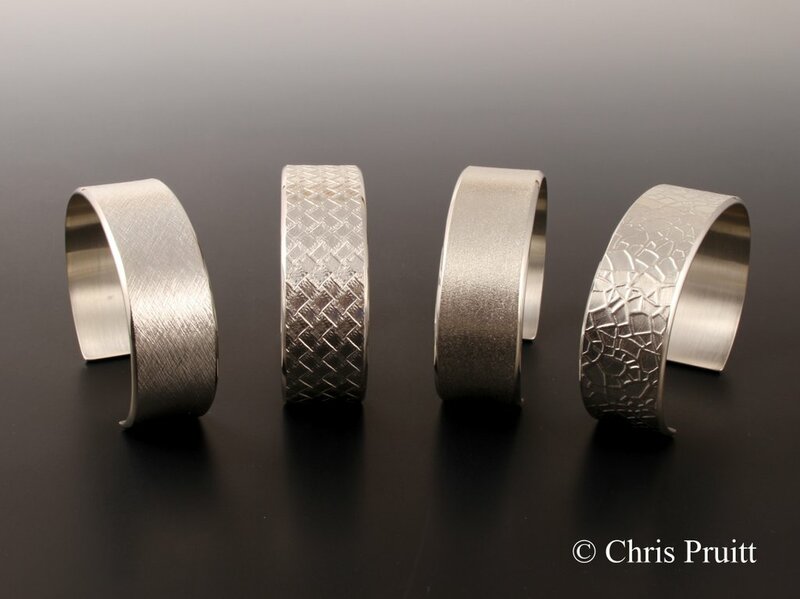 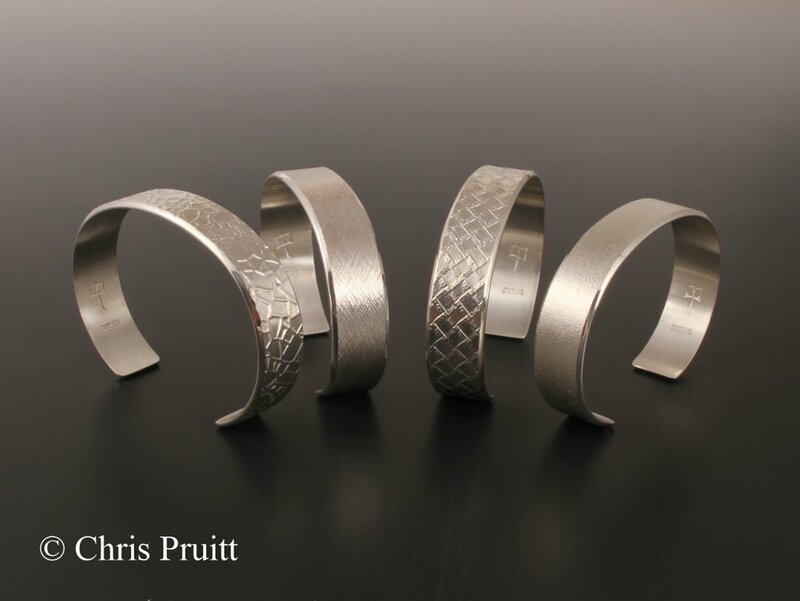 Sterling silver bracelets for Longbranch Gallery, 3/4in wide. 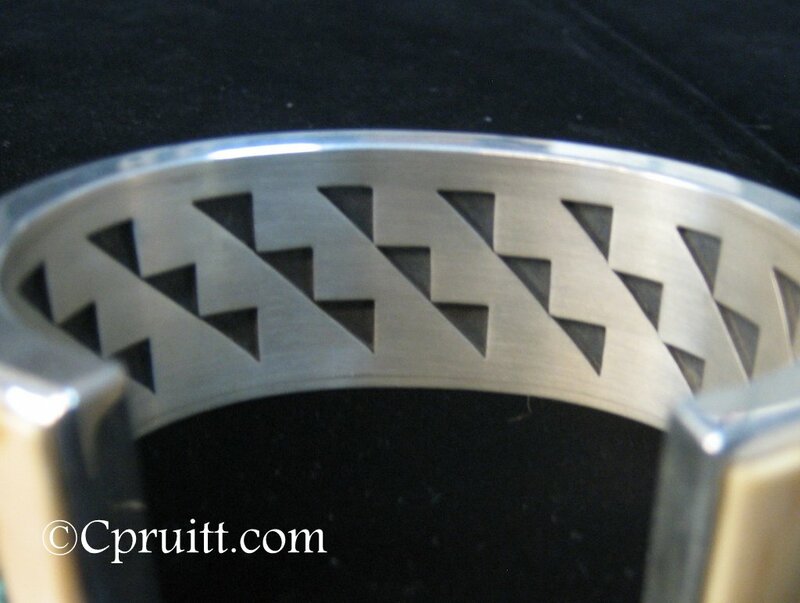 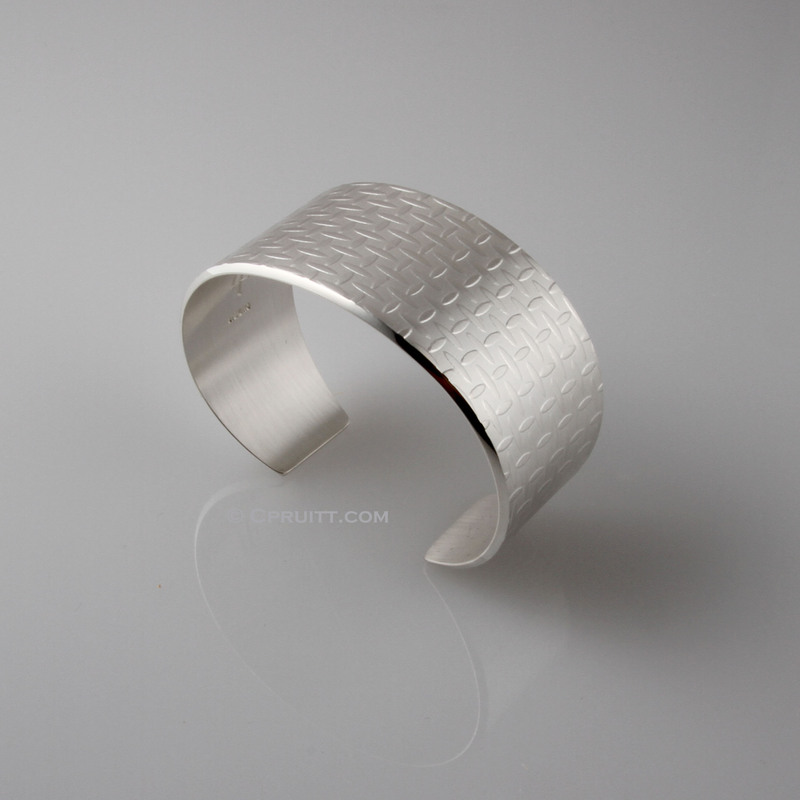 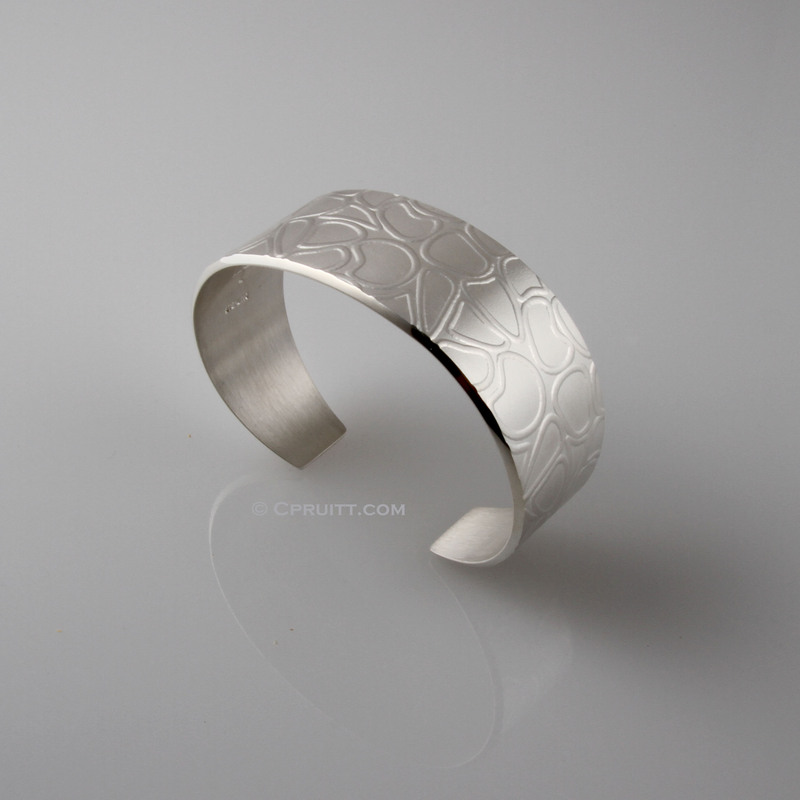 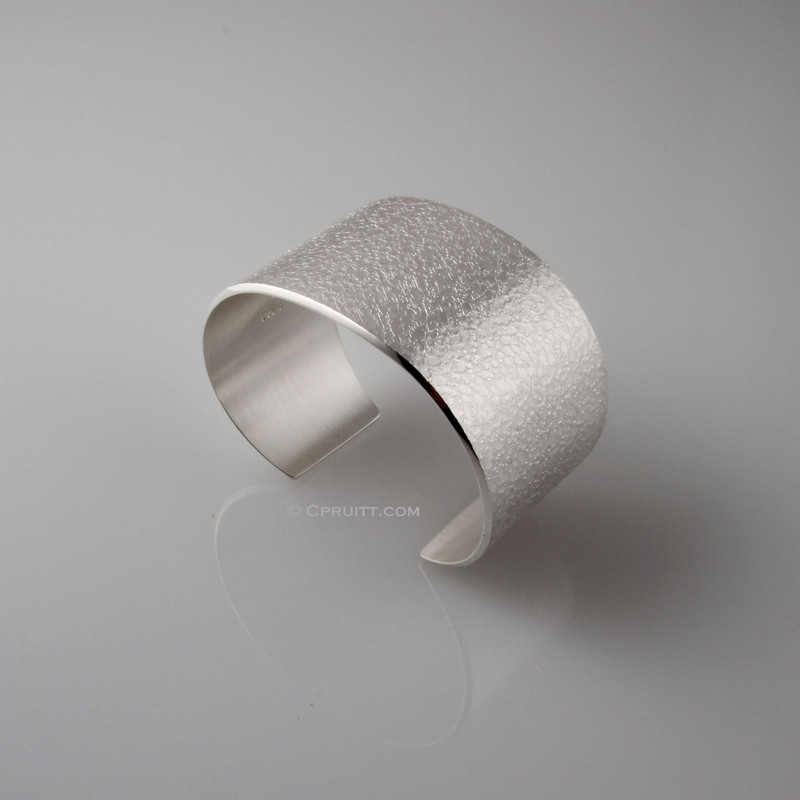 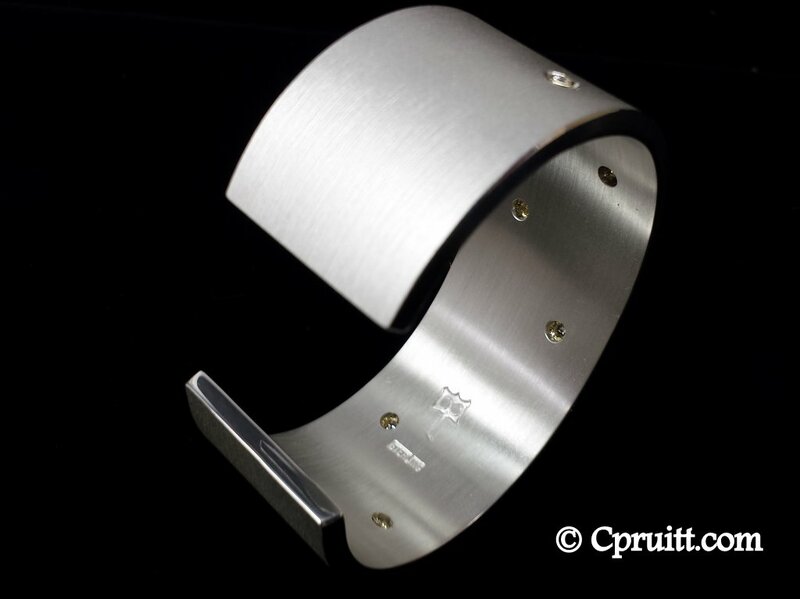 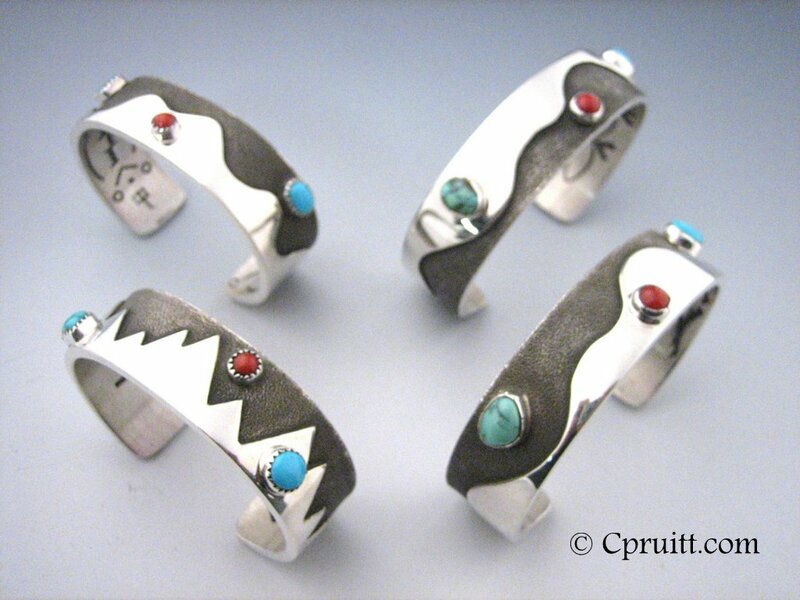 Sterling silver bracelets for Longbranch Gallery, 1/2in wide. 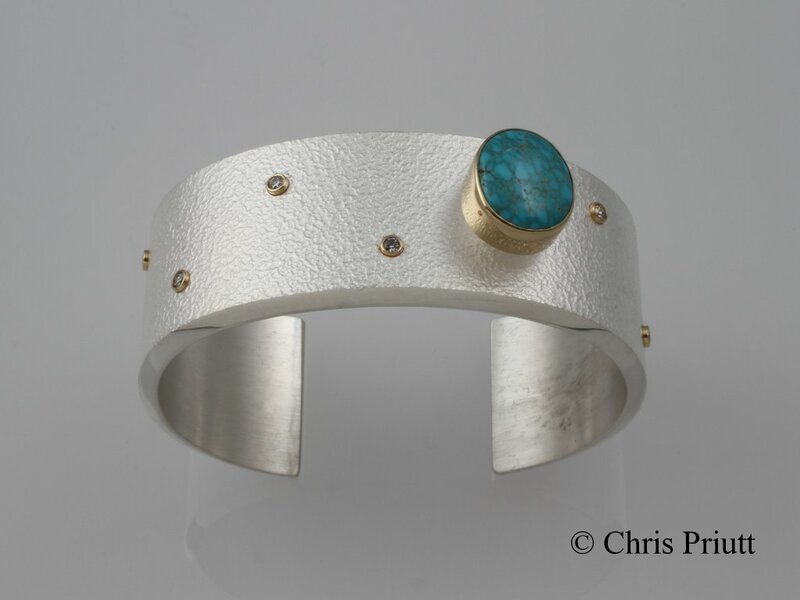 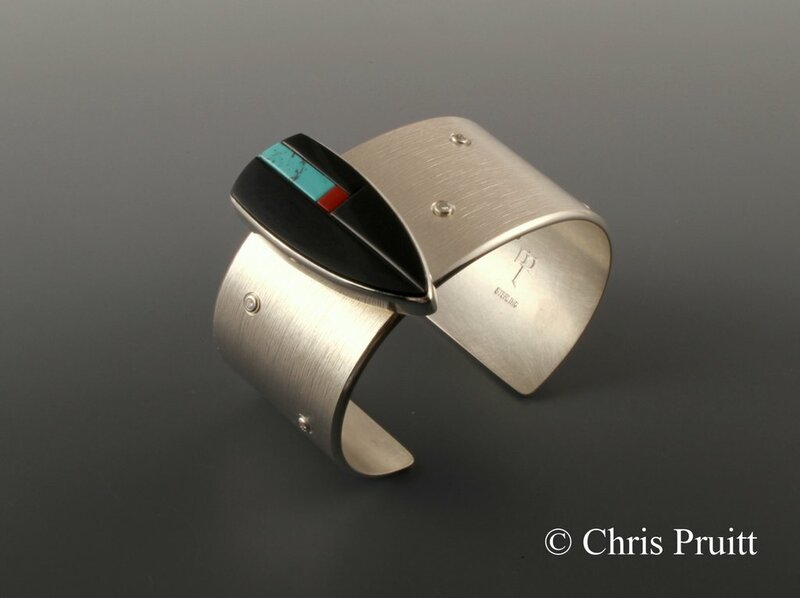 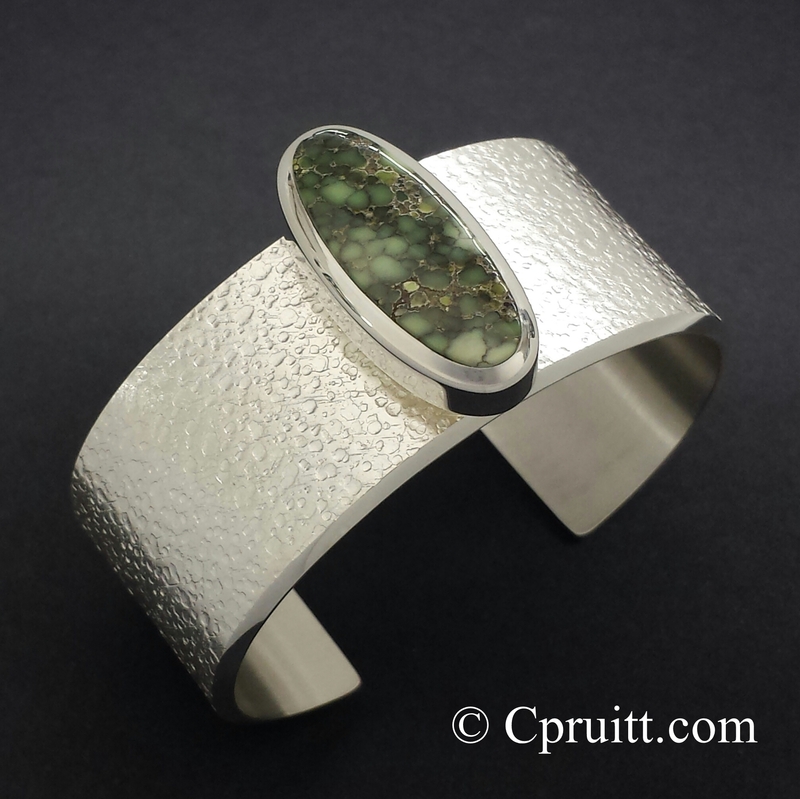 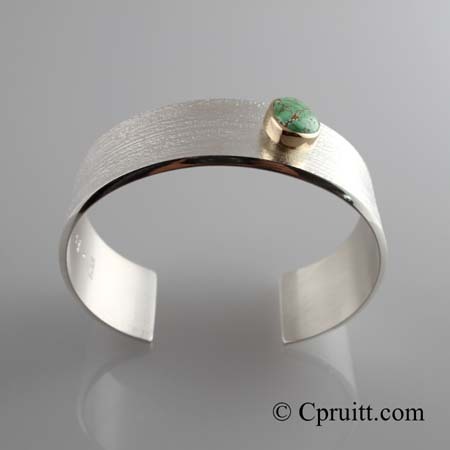 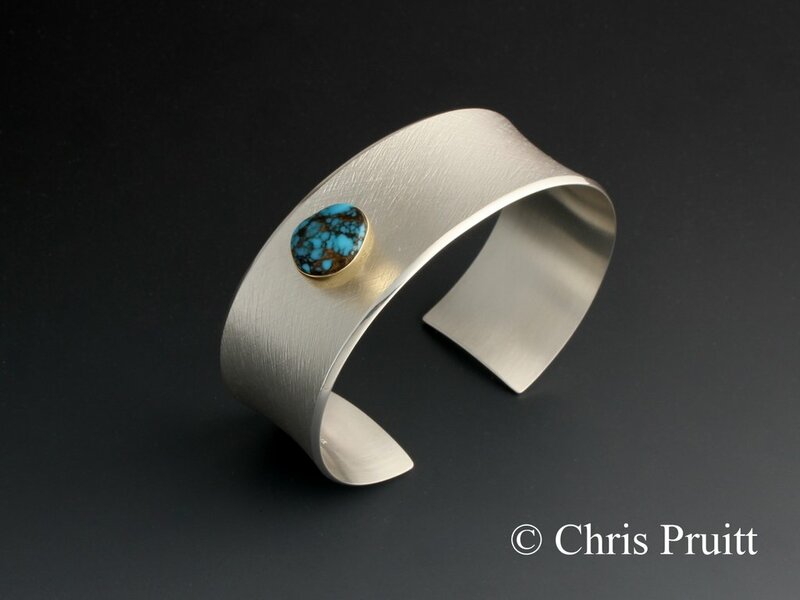 Textured, sterling silver, tapered, anticlastic bracelet with 18k gold bezel and raised Bisbee turquoise. 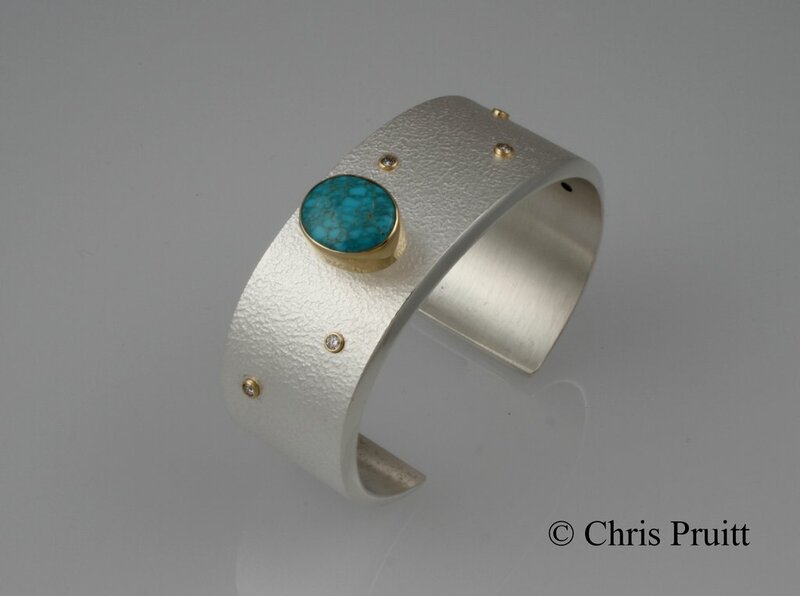 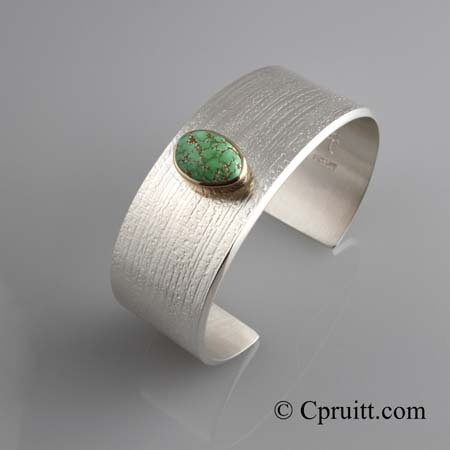 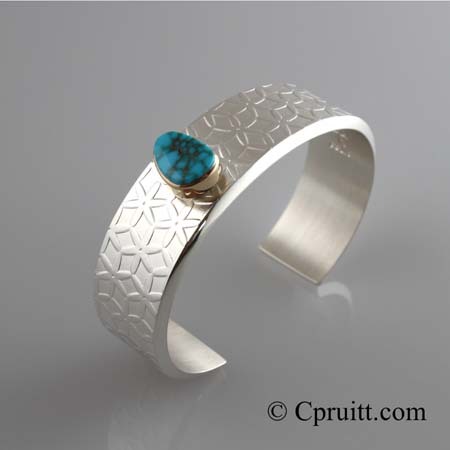 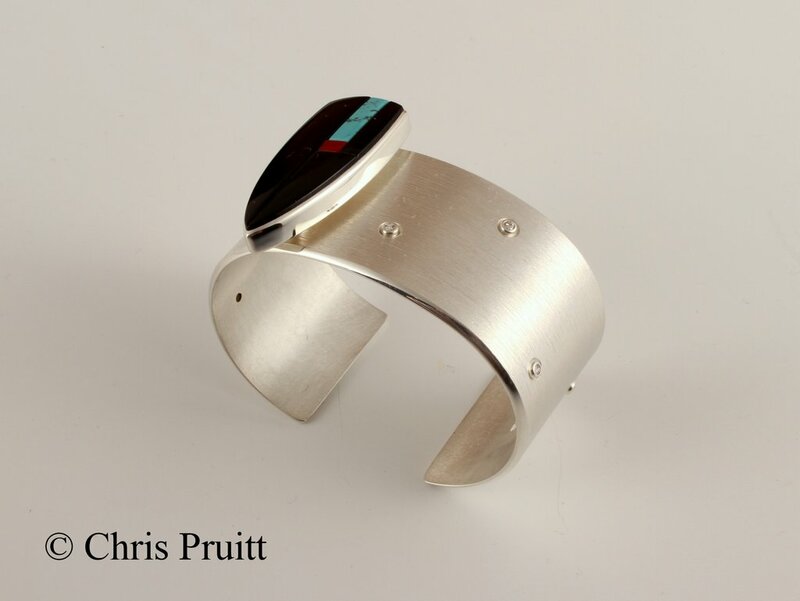 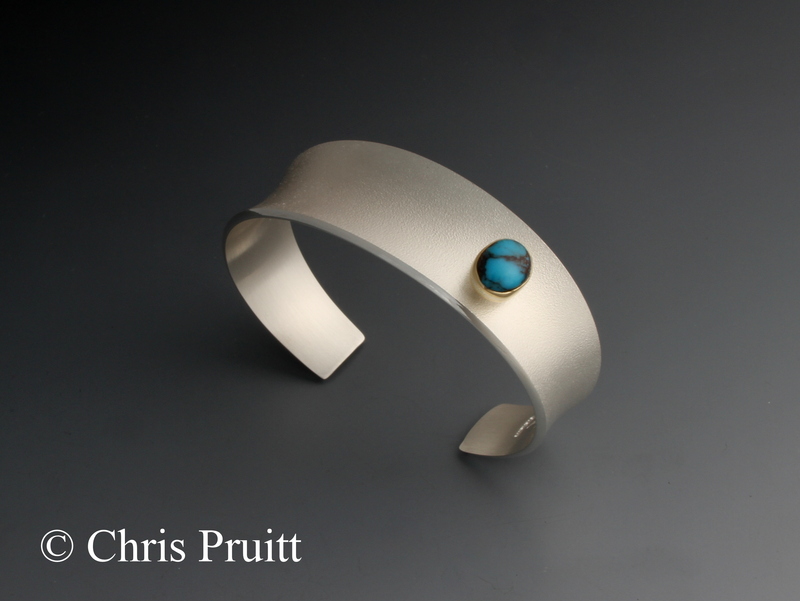 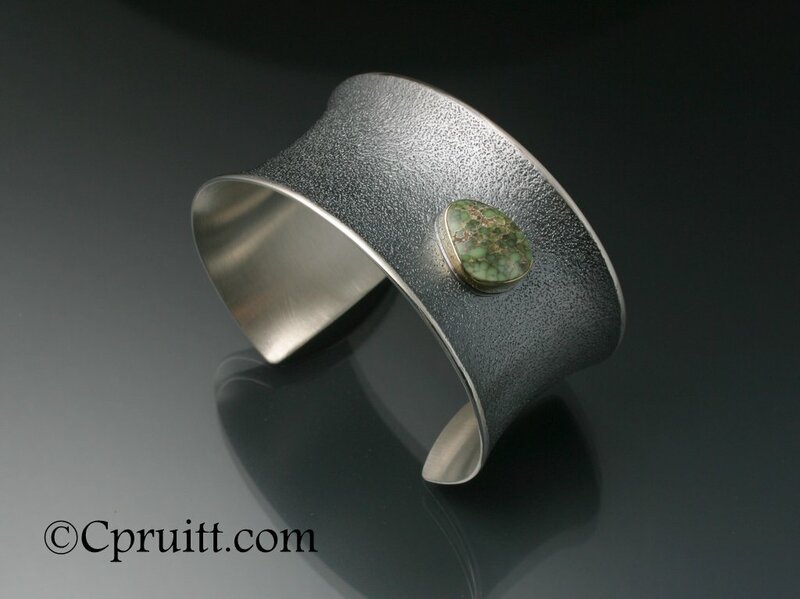 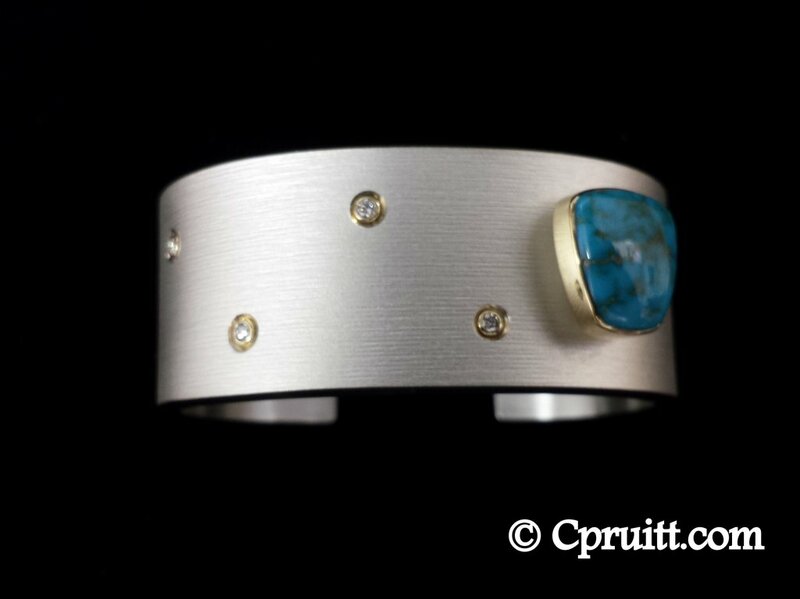 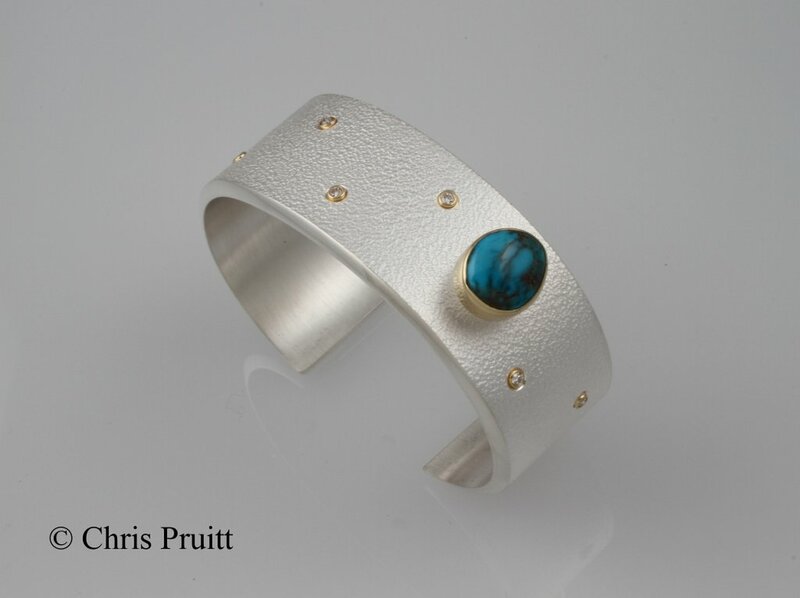 Sterling silver , anticlastic bracelet, textured surface with 18k gold bezel and #8 turquoise cabochon (custom order). 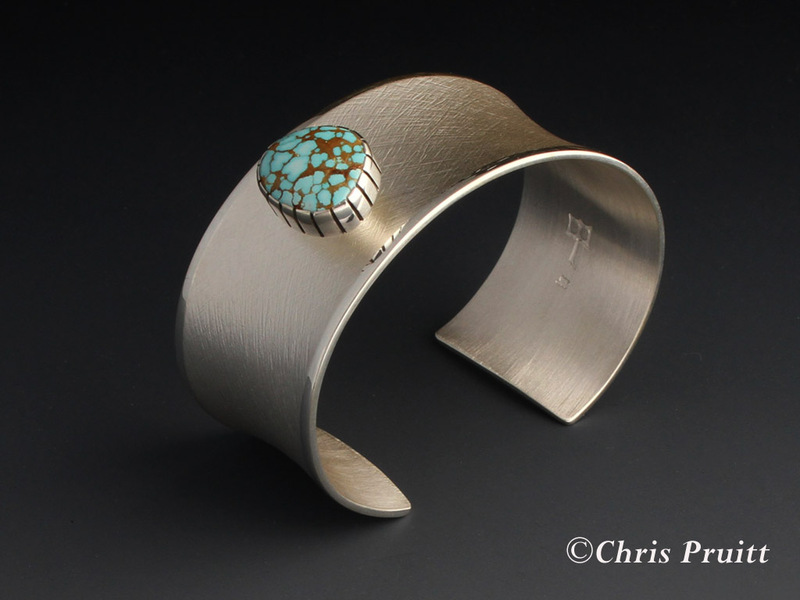 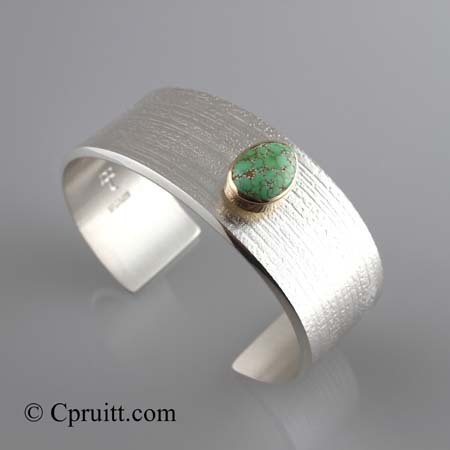 Textured, sterling silver, anticlastic bracelet with 18k gold bezel and raised Lone Mountain turquoise. 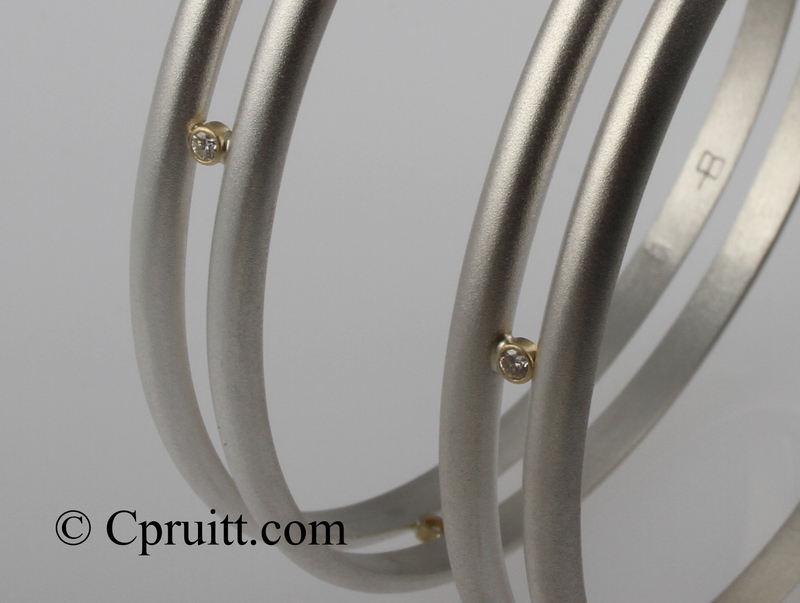 Tapered at the bottom. 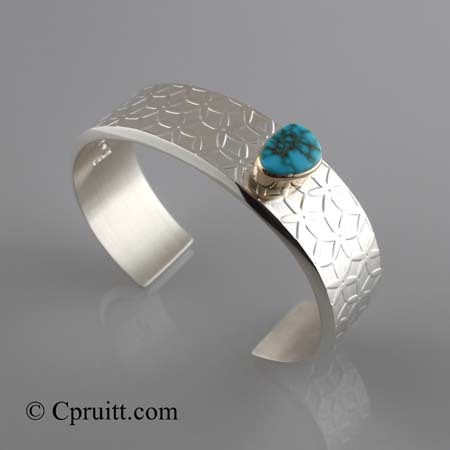 Sterling silver, anticlastic,cross hatch textured bracelet with raised Natural #8 turquoise cabochon. 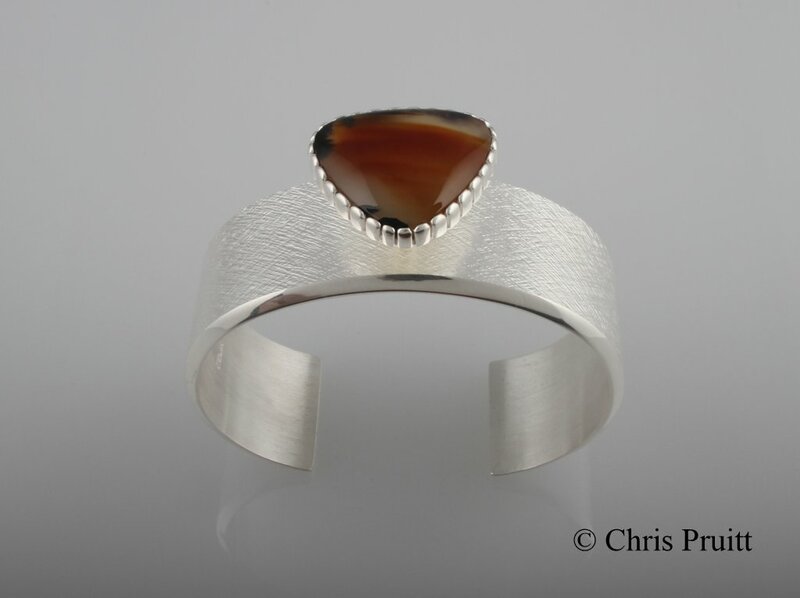 10g Heavy, Sterling Textured Bracelet with Montana Agate. 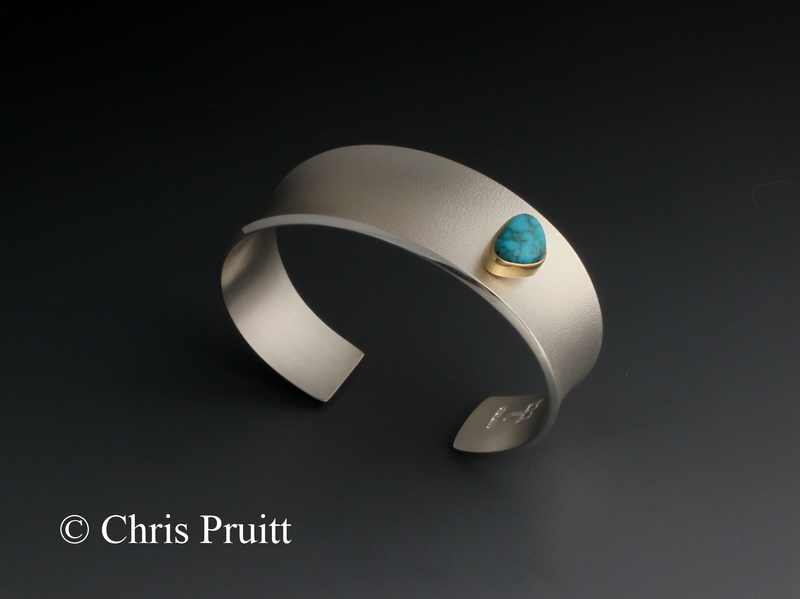 Custom Piece: Natural Lone Mtn. 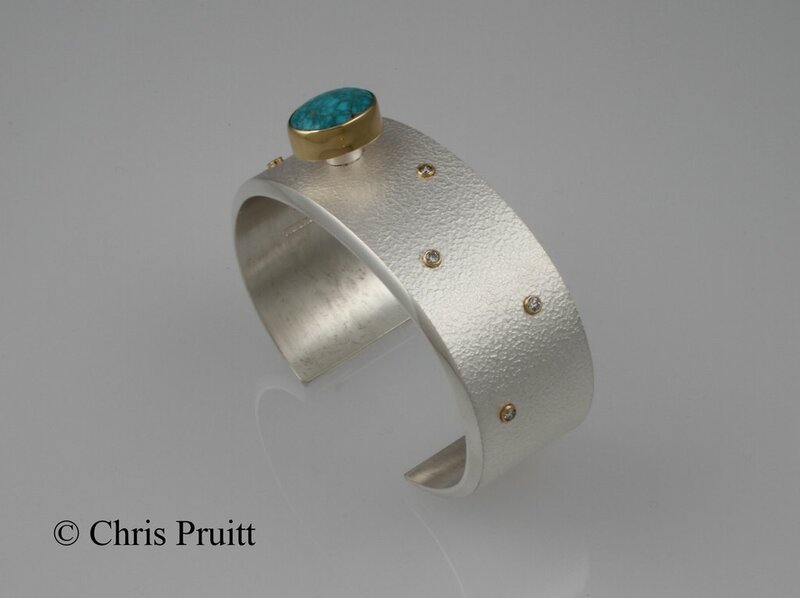 Turquoise with 18k gold and Diamonds. 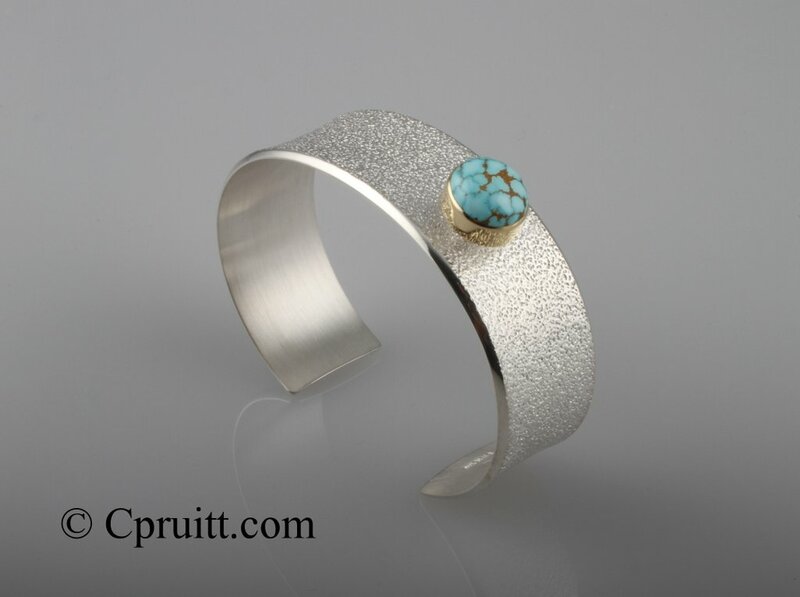 Natural Lone Mountain Turquoise with 18k gold and Diamonds. 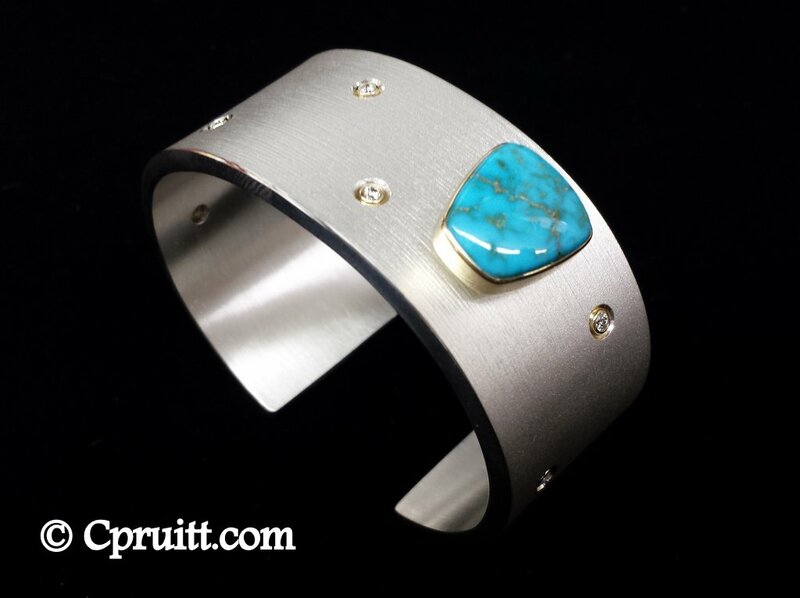 Natural Bisbee Turquoise with 18k gold and Diamonds. 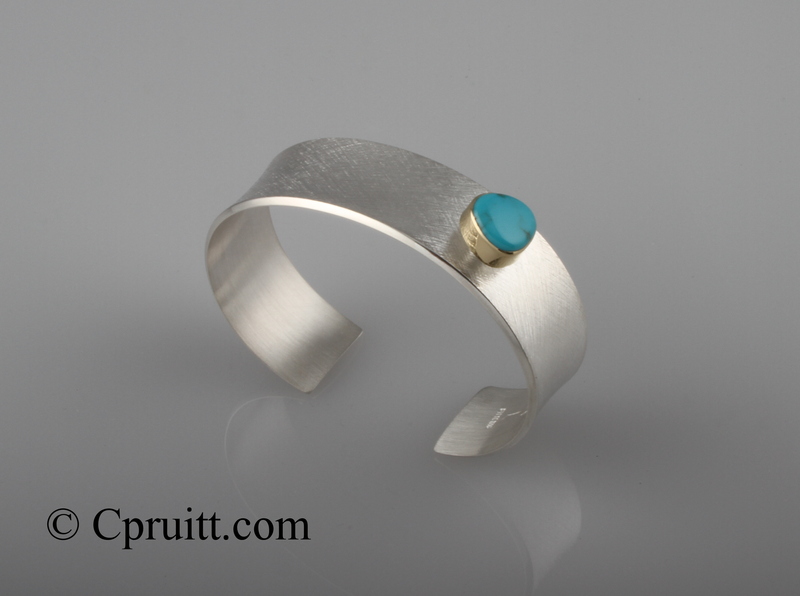 Textured, Sterling Silver, 18k, Damale Turquoise with a heavy patina. 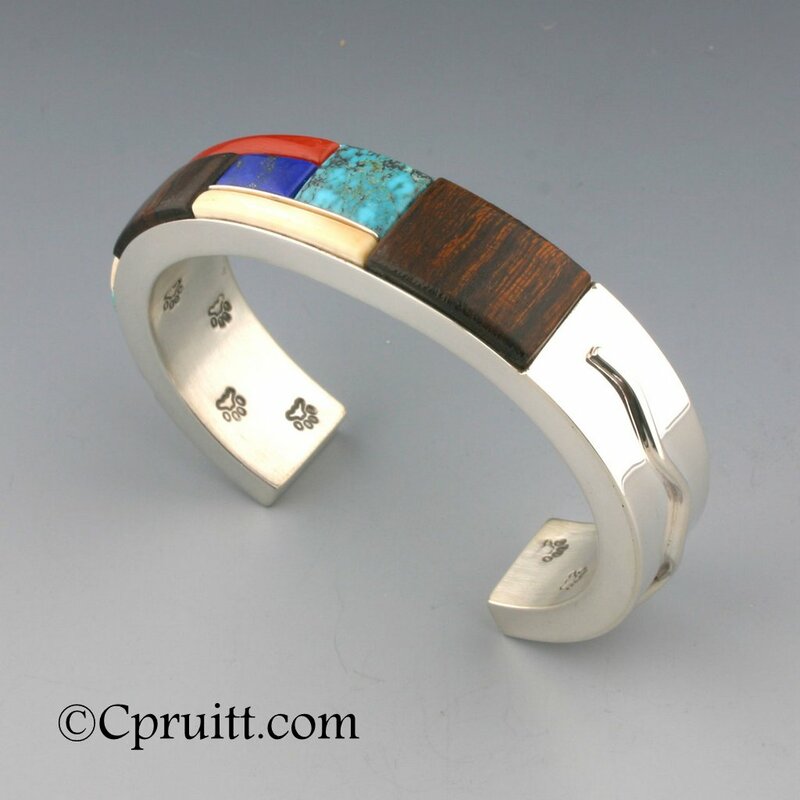 Sterling Silver, 18k, Lapis, Black Jade, Mother of Pearl and Coral. 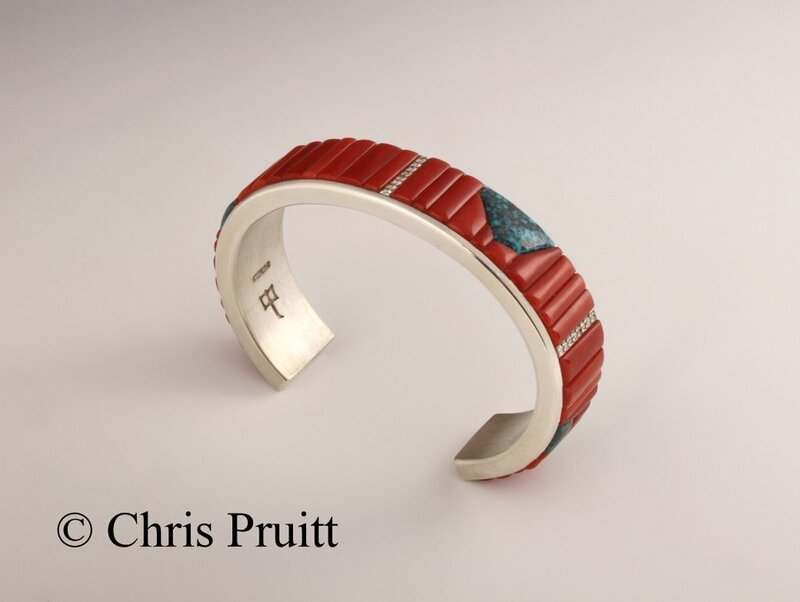 Coral Inlay Bracelet , with Bisbee turquoise, Carico lake turquoise, Sugalite, and pink coral . 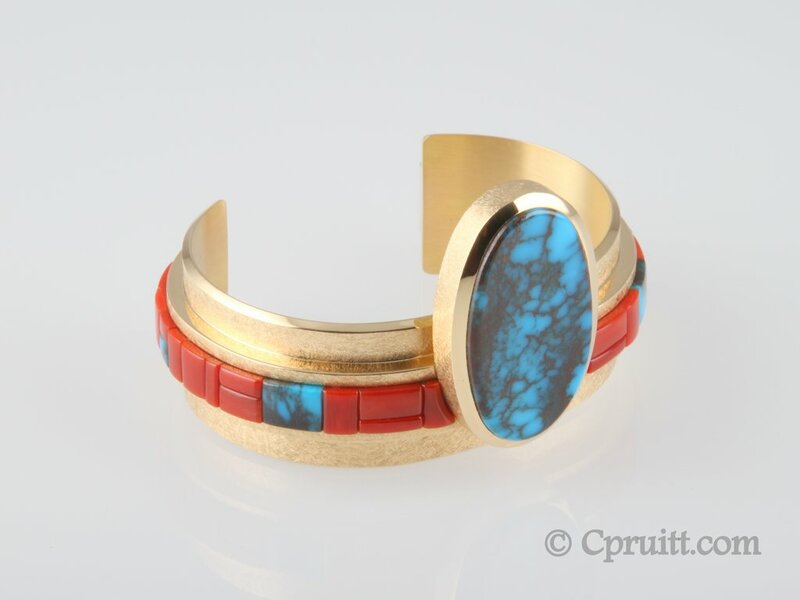 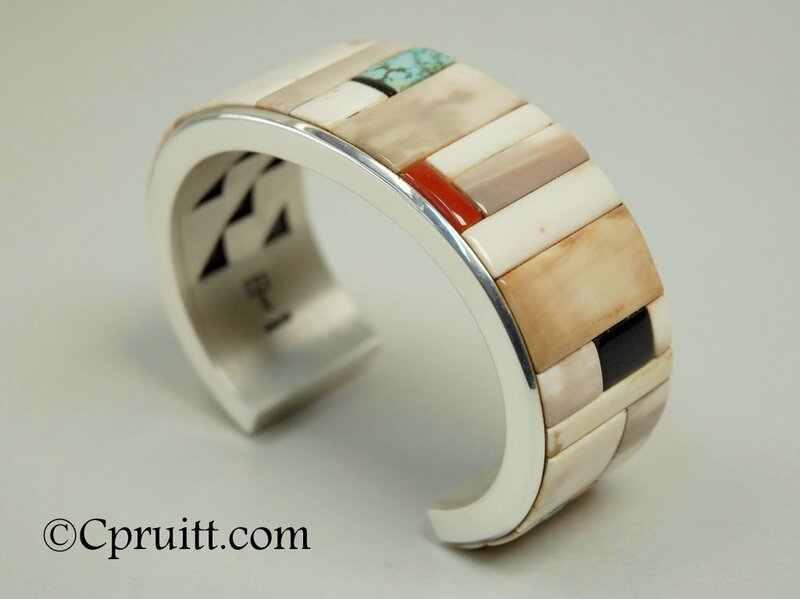 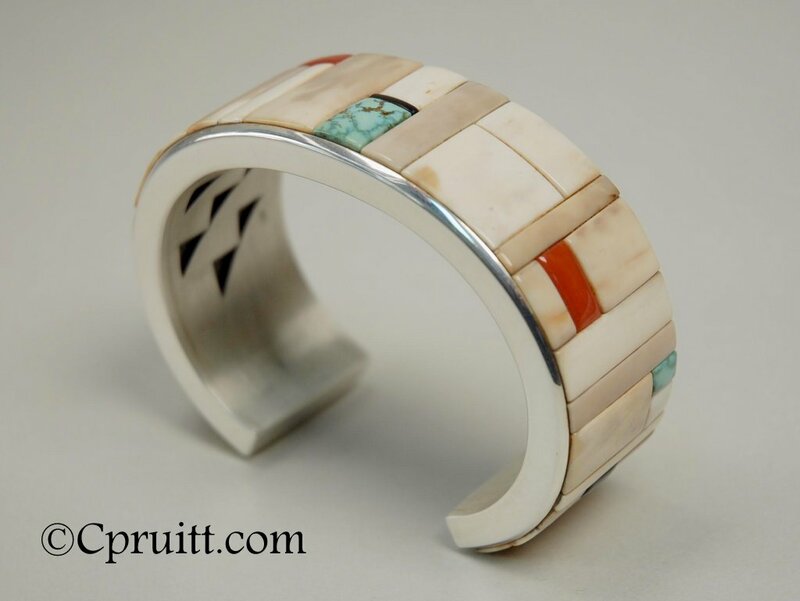 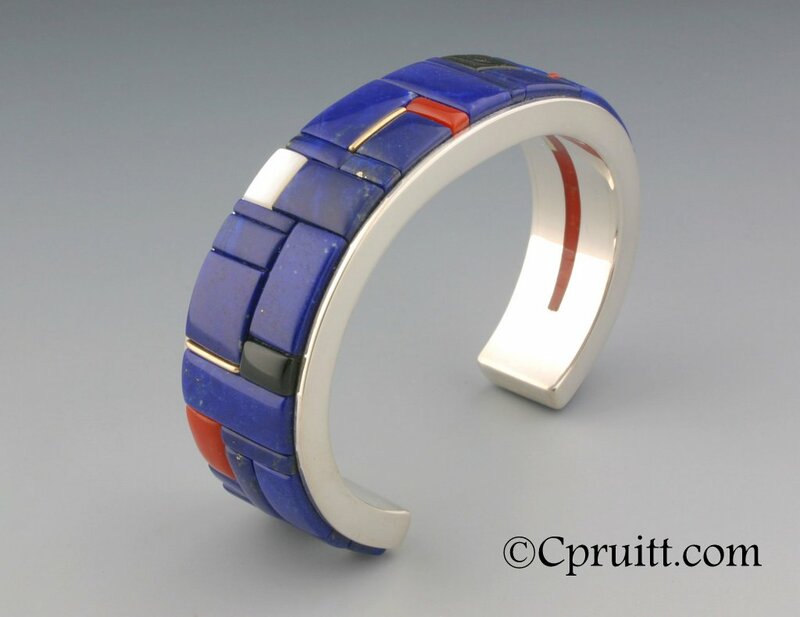 Waddell Trading Co.
Fossilized Ivory Inlay Cuff: with Black Jade, Coral and Royston Turquoise. 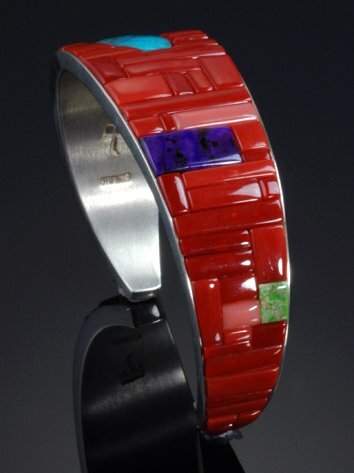 Custom Bracelet: Sterling silver, Black Jade and Coral. 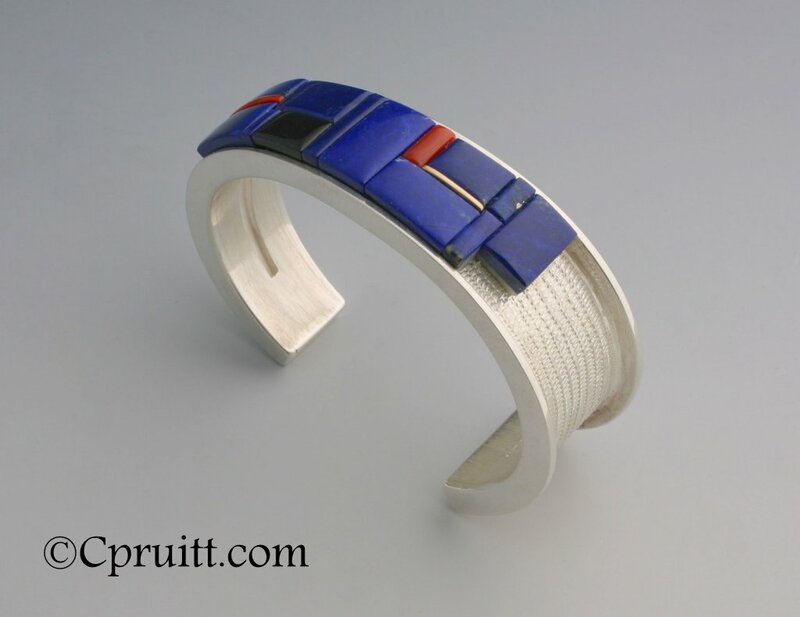 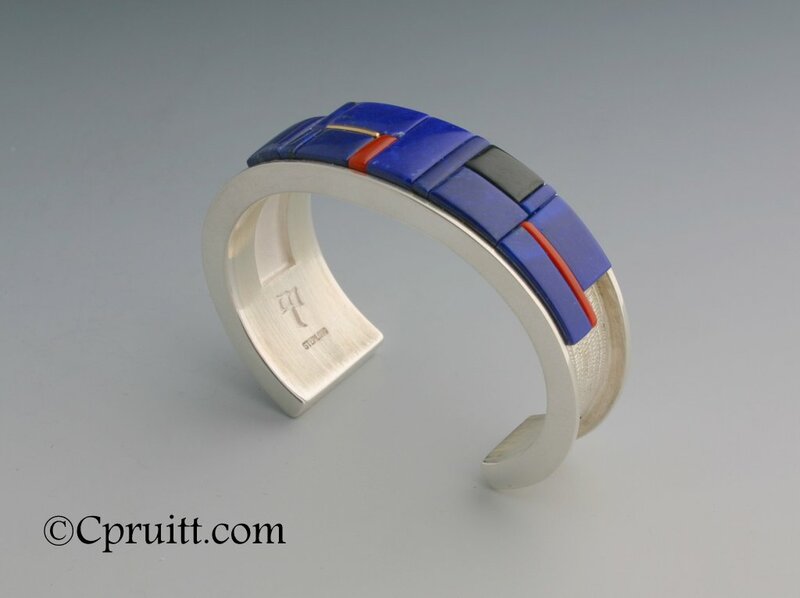 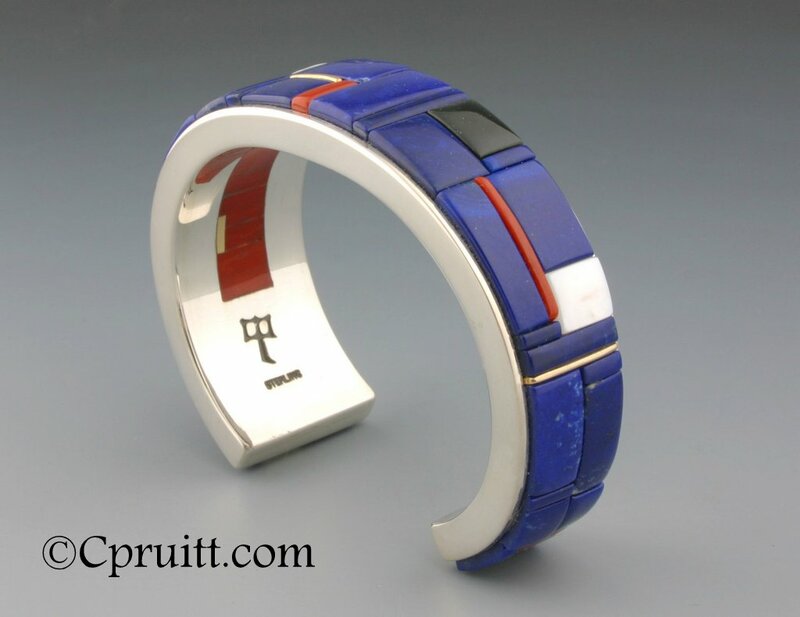 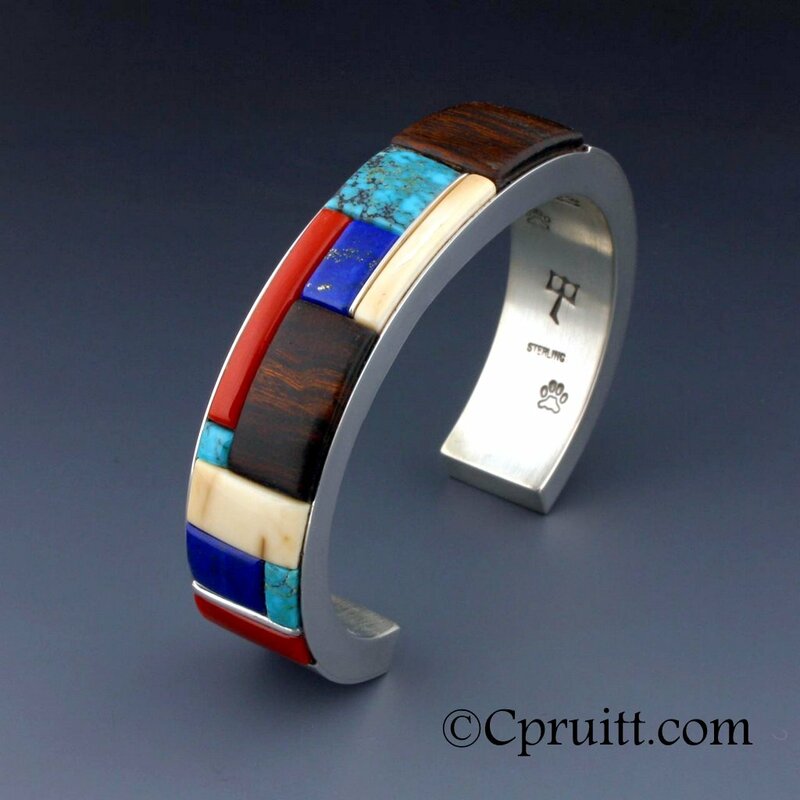 Inlay Bracelet: Sterling Silver, Ironwood, Coral, Lapis, Fossilized Ivory and Lone Mountain Turquoise. 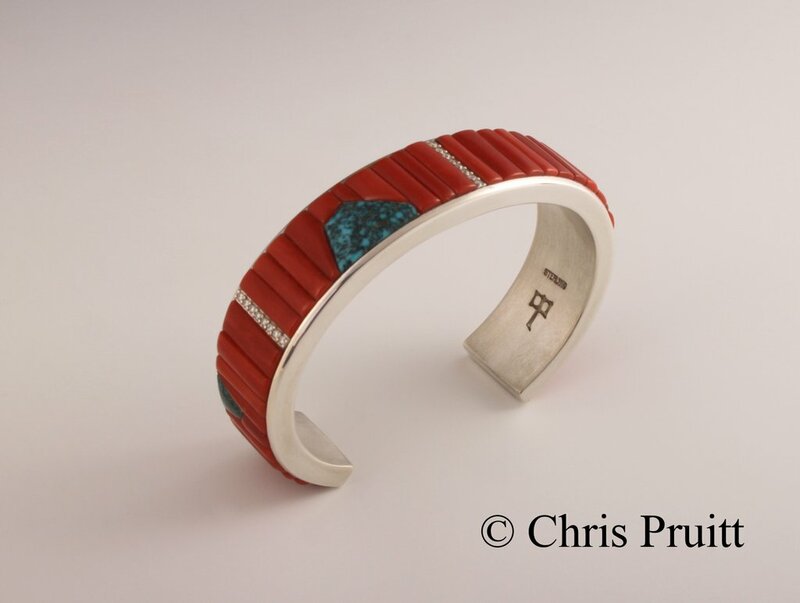 Sterling Silver, Black Jade, Ironwood, Coral and Godber Burnham Turquoise. 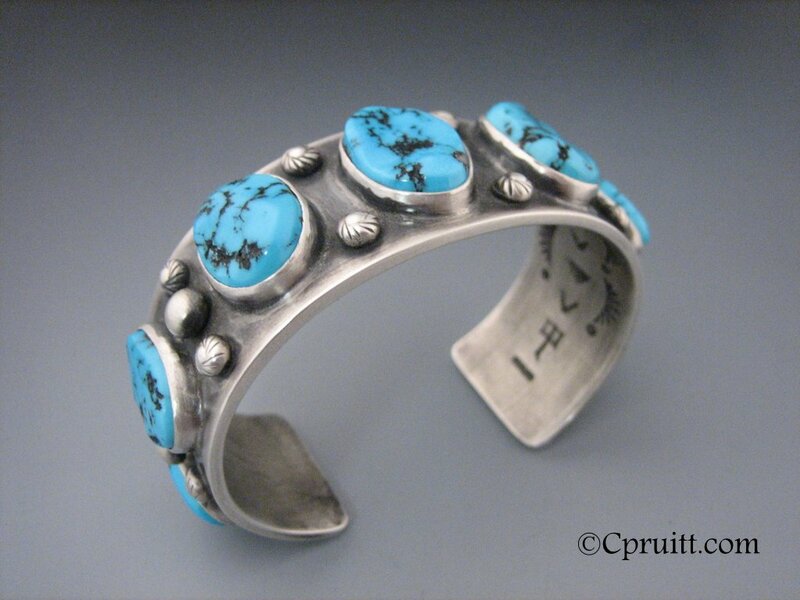 Early Overlay “Mountains & Rivers”, Stamped inside.